Why Jelastic Cloud Platform is Chosen by Developers? Today we’d like to talk about the reasons for developers to choose Jelastic as their cloud hosting platform. After questioning our customers we got three main points that persuaded them that Jelastic is suitable for their needs: fast deployment, easy scaling, and automation in management. Let’s go deeper in details. Jelastic platform supports a wide range of programming languages (Java, PHP, Ruby, Node.js, .NET, Python), application servers, SQL and NoSQL databases and other software stacks, as well as Docker containers. Developers can deploy and run different applications with no code changes. The deployment can be performed fast and easily using GIT/SVN with automatic updates, archives (zip, war, ear) right from the dev panel or via integrated plugins like Maven, Eclipse, NetBeans, IntelliJ IDEA. The platform provides automatic vertical and horizontal scaling of applications. Automatic vertical scaling is a unique feature of Jelastic Cloud. The developers just specify the maximum limit of resources for every instance and the system automatically allocates the needed amount. To get the discount, there can be reserved some fixed number of resources that are consumed by the application on a permanent base. The resources of RAM and CPU are sliced with granular units (cloudlet – 128MiB and 400MHz), so there is no need to reserve more that it is really required. By setting up the specific triggers you can add or remove the instances in the environment during load spikes or when the application is not overloaded. The traffic is evenly distributed with load balancer across multiple servers. Jelastic offers a self-service portal with user-friendly UI. Developers dashboard includes intuitive application topology wizard, deployment manager, access to log and config files, marketplace with prepackaged applications and functionality for team collaboration. Integrated IDE plugins provide more options for application management: IntelliJ IDEA, Eclipse, NetBeans. 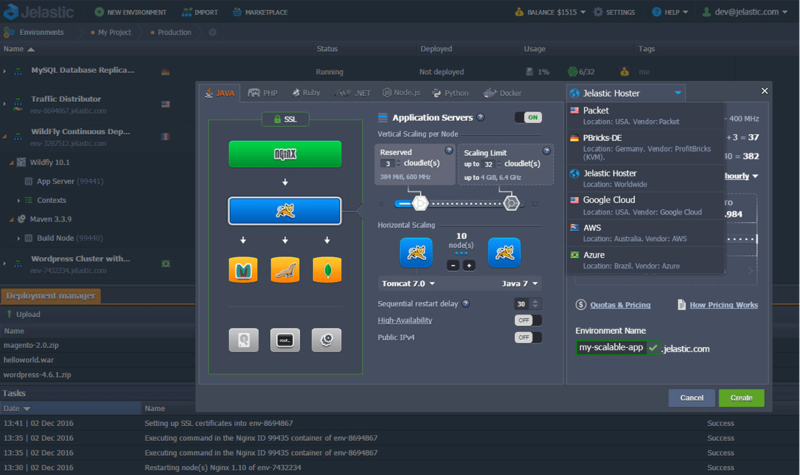 Some of our hosting partners offer several hardware regions within a single Jelastic panel so you can distribute the workloads of application across several locations. In contrast to the majority of other cloud hosting vendors, Jelastic provides a truly user-oriented Pay-per-Use charging approach. With automatic scaling you can allocate exactly the needed amount of resources with no need to reserve extra capacity. Find more answers on frequently asked questions and start your free trial at our developers page. Please share your feedback what problems you’ve already solved with Jelastic cloud platform and what other features are needed to meet your requirements.